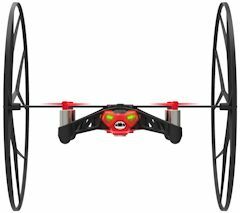 The clear hit at my Holiday Gadget talks this season has been the Parrot MiniDrone Rolling Spider -- a personal mini drone toy that normal humans can have fun with, even without needing videogame reflexes. Verizon Wireless kindly loaded the MiniDrone from its Holiday Gift Guide as a great demo of the amazing capabilities of today's wireless technology. This does not even come with a controller -- It's totally managed and flown from your smartphone. So for around $99, you too can have your own personal mini drone, to fly around your house or yard, do tricks, and shoot photos. What makes the Rolling Spider work so well is that is a quadricopter, with four rotors. This balanced design is particularly popular for drones, as it allows for smaller motors and blades and easier control. In addition, the Rolling Spider has multiple onboard sensors and processing that allow it to launch itself from the floor at the push of a button, stabilize itself, and then hover still in the air until you move it. You even can blow on it as it is hovering, and it will re-stabilize. The sensor technology packed in the MiniDrone for autopilot flying is amazing, including a 3-axis gyroscope, 3-axis accelerometer, pressure sensor for altitude, ultrasonic sensor for precision flying near the ground, and vertical camera at 60 fps to measure speed by comparing to the previous image. As a result, normal people can fly this drone. You use the Parrot FreeFlight app on your smartphone (iOS, Android, or Windows Phone) to control it over Bluetooth. Fly in any direction (up to 11 mph), turn, and move up and down. It also has built-in tricks, to flip 360 degrees forward or backward -- again then automatically stabilizing and hovering in place. As a proper drone, the Rolling Spider also has a downward-facing mini-camera, so you can take photos using the smartphone app. You can then download the photos when you're done flying, you can't watch video in real time. But this definitely a toy, mini-sized and ridiculously light about 2 ounces. The body frame is around 2 1/2 by 1 1/4 inches, and the rotors span 7 inch diameter. The Rolling part of the name comes from a pair of large removable wheels that you can clip on to allow you to roll it along floors, walls, and ceilings. The wheels also provide protection for the blades if you happen to crash against the wall or ceiling -- When it senses a collision it automatically shuts down and drops to the floor. You also can use the MiniDrone outdoors, but it's really too light to handle a non-trivial breeze. The light weight also means that it cannot carry the weight of a heavy battery, so it runs only around five to eight minutes on a charge. It then takes about an hour to recharge. You also can use the Parrot Cloud to share and view sessions, acrobatics, and photos. The Parrot MiniDrone Rolling Spider is available for $99, in white, blue, or red. It also comes with stickers to personalize its look. It's lots of fun at home with family and kids, and to fly over the audience at talks. Check out the Parrot site for other drone designes, including more rugged ground and flying designs with live video. The Phiaton Chord MS 530 headphones are a high-end product that come loaded with features -- Bluetooth 4.0 wireless, voice microphone, and active noise cancelling. The Chords start as sharp-looking on-ear headphones, part of the Phiaton Moderna Series, "known for its bold styling, modern aesthetics and world class sonic performance." They have solid design at 0.64 pounds, with a metallic and black look plus red highlights. The side pieces are bent in and fold up for compact storage. The earpieces are flat and not cupped to cover the ears without surrounding them. The sound is driven by 40mm drivers that have a titanium coating to enhance the sound quality. Plus the Chords offer active noise cancelling, removing up to 98 percent of ambient background noise. 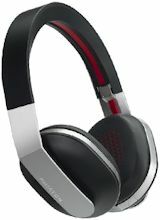 And they are wireless, using Bluetooth version 4.0 for improved sound quality, greater range, and extended battery life. They also support multipoint connections, simultaneously with two devices. The headphones also include dual microphones for voice calls. These provide echo cancellation and noise suppression to help separate your voice from surrounding background noise. They also come with a cable so you can use them on airplanes and in other non-wireless environments. The cable includes an inline remote control and mic. The Chords charge through a microUSB connector, with an impressive battery life of up to 30 hours of talk or music time, or 18 hours with noise cancelling. Even better, they will contrinue to work passively with the cable even if the battery runs out, so you can continue listening to music or making phone calls. The Phiaton Chord MS 530 headphones provide a cornucopia of sound, wirelessly, with the bonus of active noise cancelling, all with a sharp design. They're available for around $299. Amazingly for software starting at $69, CyberLink PowerDirector 13 is not anybody's idea of "consumer" level video editing -- in fact, it's not really even "enthusiast" level either. Instead, PowerDirector offers serious, professional toolkit editing -- including 2K/4K resolution, 100 tracks, titles and subtitles, customizable effects, overlay animation with motion blur, multicam, hardware acceleration, and much more. - PhotoDirector 6 provides photo editing and adjustment and background removal, including 64-bit support for RAW images, and adds a clever Face Swap tool to merge multiple group shots and automatically pick the best faces. - AudioDirector 5 provides round-trip audio editing, noise reduction and repair, including visual editing in frequency spectrum view, and adds an amazing vocal transformer tool to alter vocals by gender and age (or like a robot or a duck). - And for even more pro-quality results, there's also ColorDirector 3 for color grading, adjustments, and effects. At consumer level pricing, you can isolate objects, apply motion tracking, and then change or enhance color. This release also adds split toning color to adjust shadows and highlights. The basic PowerDirector 13 Deluxe is priced at $69 for up to 2K editing, and the full PowerDirector 13 Ultra is $99, adding 4K and 3D support, Blu-ray authoring, multicam, content-aware editing, full HD quality previews, and CyberLink Cloud support. Then PowerDirector 13 Ultimate for $129 adds additional NewBlue Video and other effects and templates. The PowerDirector 13 Ultimate Suite for video editing for $249 adds ColorDirector, AudioDirector, and additional cloud storage. The full Director Suite 3 for $299 also adds PhotoDirector. Download a 30-day trial and try these out for yourself. Ultimate Ears specializes in custom fitted earphones for professional musicians and touring artists. As part of Logitech, it also has been expanding its line of premium speakers and earphones for the consumer market -- as I've covered previously. The current headliner is the Ultimate Ears UE BOOM wireless Bluetooth speakers. The UE BOOM delivers great sound, with dual 1.5", 4 Ohm performance drivers for mids and highs and dual 2" passive radiators for bass low frequencies. These provide clean sound at full volume, loud enough to fill a room (but not blow it out). Even better, it's designed to provide "360 degree" all-around sound, radiating in all directions. You also can use the UE Boom app for iOS & Andoid to pair two speakers for stereo, or to double the sound. It also provides features including an alarm, 5-band equalizer, and customized settings. The BOOM plays music (and also can act as a speakerphone) up to 50 feet over Bluetooth, connecting up to two devices at the same time, and remembering up to 8 paired Bluetooth source devices. It also supports quick tap connection to NFC-enabled devices. The design is a tall cylinder, 7.1 inches tall, 2.6 inches in diameter, and weighing 19 ounces. You can play it standing up vertically, lying down horizontally, set up in a cupholder, or clipped to a backpack (there's a tripod mount). The BOOM also works outdoors, protected by a colorful acoustic skin with plasma coating. It's water and stain resistant, and can be cleaned by wiping with a damp cloth. It charges though micro-USB in 3 1/2 hours, and plays for 15 hours. There's also a 3.5mm audio jack for wired input. The Ultimate Ears UE BOOM is available for around $169, in a wide varity of colors as well as two-tone and other fun designs. If you have smaller kids or grandchildren, you know that the tablet is today's version of Sesame Street on TV -- a great way to distract all that energy for a moment or two of peace, with the premise that you're providing an educational benefit for them. Even toddlers can have a great time tapping (or stabbing) at symbols and colors, making music, or endlessly watching themselves in home videos. Of course, while the TV remote control can be sacrificed to inquisitive fingers, it's not so cute watching kids run around with a several-hundred-dollar tablet. So you might consider the Speck iGuy kid-friendly protective case for your iPad or iPad mini. It's made from tough EVA foam, so it can handle bumps and drops while still being flexible and lightweight. It's colorful and fun for kids, with soft arms on the sides that they can use to carry it around. And to make you more comfortable, it has a deep frame to recess the screen away from danger. You still also may want to add a screen protector. 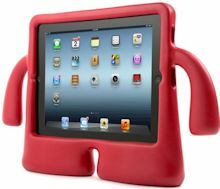 The Speck iGuy case is available in several bright colors for iPads and iPad minis starting at around $20. Entries posted to Manifest Tech Blog in December 2014, listed from oldest to newest.